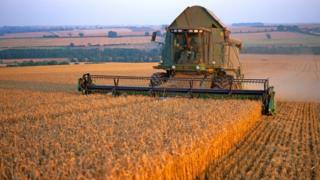 The UK food industry has threatened to stop co-operating with government policy consultations, saying it is busy trying to stave off the “catastrophic impact” of a no-deal Brexit. The warning came in a letter to Environment Secretary Michael Gove from more than 30 business leaders. They said it looked “ever more the likeliest outcome” that the UK would leave the EU without an agreement. They added that it was a “moment of potential crisis” for their industry. Those signing the letter included the heads of the Food and Drink Federation, the National Farmers’ Union and UK Hospitality. “Neither we nor our members have the physical resources nor organisational bandwidth to engage with and properly respond to non-Brexit related policy consultations or initiatives at this time,” they wrote. The firms urge the government to place a range of current and planned industry consultations on “pause” until the Brexit uncertainty is over. The consultations the firms cite include one relating to further curbs on the advertising of sugary foods, a national recycling collection strategy and proposals for a tax on plastic items with less than 30% recycled content. The letter, first reported by Sky, is further evidence of the industry’s frustration at the continuing lack of certainty over the Brexit process. “Businesses throughout the UK food chain – and their trade associations – are now totally focused on working to mitigate the catastrophic impact of a no-deal Brexit,” says the letter, which was sent last Friday. The letter comes just two weeks after major retailers warned MPs that a no-deal Brexit would cause huge disruption to the industry, leading to higher prices and empty shelves in the short-term. Sainsbury’s, Asda and McDonald’s were among those who warned stockpiling fresh food was impossible, and that the UK was very reliant on the EU for produce. What Does the Meghan Markle Effect Really Mean?